Background: This systematic review will address the need for a better understanding of the impacts of fish entrainment and impingement associated with hydroelectric dams on fish productivity in freshwater temperate environments. As the number of dams continues to increase worldwide, so too has concerns for their effects on fish populations. Fish injury and mortality at hydroelectric facilities may have serious consequences for fish populations, which are generally the result of three main sources: (1) fish passage through hydroelectric facilities (i.e., turbines, spillways, sluiceways, and other passage routes) during downstream migration for migratory fish; (2) the entrainment of resident fish; and (3) the impingement of fish (migratory or resident) against screens/trash racks. Most studies on the impacts of entrainment and impingement at hydroelectric facilities on fish have primarily focused on: (1) how fish injury and mortality occurs; and (2) evaluations of the effectiveness of various management strategies used to mitigate harm during downstream passage. Given the contributions of migratory and resident adults and juveniles to fish production, a necessary extension is to evaluate the impacts of fish injury and mortality from hydropower dam entrainment and impingement on fish productivity. 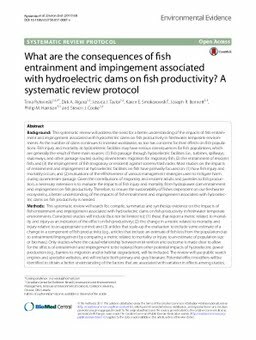 Therefore, to ensure the sustainability of fishes dependent on our freshwater ecosystems, a better understanding of the impacts of fish entrainment and impingement associated with hydroelectric dams on fish productivity is needed. Methods: This systematic review will search for, compile, summarize and synthesize evidence on the impacts of fish entrainment and impingement associated with hydroelectric dams on fish productivity in freshwater temperate environments. Considered studies will include (but not be limited to): (1) those that report a metric related to mortality and injury as an indication of the effect on fish productivity; (2) the change in a metric related to mortality and injury relative to an appropriate control; and (3) articles that scale-up the evaluation to include some estimate of a change in a component of fish productivity (e.g., articles that include an estimate of fish loss from the population due to entrainment/impingement by comparing a metric related to mortality or injury to an estimate of population size or biomass). Only studies where the causal relationship between intervention and outcome is made clear to allow for the effects of entrainment and impingement to be isolated from other potential impacts of hydroelectric power production (e.g., barriers to migration and/or habitat degradation), will be included. The review will use public search engines and specialist websites, and will include both primary and grey literature. Potential effect modifiers will be identified to obtain a better understanding of the factors that are associated with variation in effects among studies, given differences in: (1) site-specific factors (e.g., turbine type, size, power output); (2) methodologies and study designs used to assess impacts; and (3) biological factors (e.g., fish life history stage, body size and morphology). Study quality will be assessed to allow for critical evaluation, including study design, confounding factors and statistical analysis. Data will be compiled into a narrative synthesis and a meta-analysis will be conducted where data availability and quality allow.